roll up, glass, aluminum, and more! Wood Doors are primarily used when security, weathering, or pricing is not a concern. Wood Doors are available in many shapes, styles, and grains. The interior of office buildings are the most popular place for a wood office door, along with; churches, hospitals, etc. Where you can find them: Offices, Churches, Hospitals, Commercial Buildings, Industrial Warehouses, etc. From panic hardware to exterior locks, our technicians are well trained to work on all types of hardware. Whether you need to meet fire codes or just want an upgrade. We keep a large inventory to make sure we have what you need and we will find the right product to meet your needs and budget. 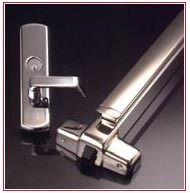 At McKernan Door we are happy to supply only or install the products you purchase from us. We can service or replace whichever type you have, whether you have a surface mount, overhead concealed, or a floor closer. We keep a large inventory of hardware in stock to get you up and running right away!